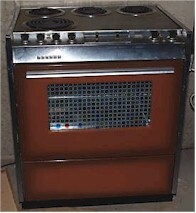 I had a copper tone stove just like that in the 70's, except it was a gas model. It was a "bit" used and battered when we moved into the house we rented, but I loved it anyway. I had a green side by side I bought used in the 80's .It weighed a ton and My cousin helped me move it ,He dropped it on his leg leaving a nasty bruse. Still have our 1965 Westinghouse copper refrigerator with robin's egg blue interior which still looks and works great ... quiter than the modern thing in our kitchen ! "You can be sure if it's Westinghouse"
Back in the mid-1960s we moved into a 1950s rambler that had turquoise appliances. For some reason my mother decided to paint the kitchen walls lime green above the chair rail and dark blue below it. Talk about a "pop" of color - hers was a BOOM. Now that you mention it, I remember. It was called Harvest Gold. 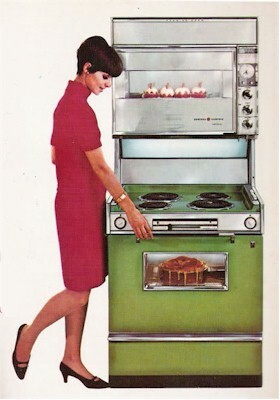 There were also pink appliances in the 1950s. My grandmother had a pink Kenmore washing machine and I know a woman who still has her pink gas range. There were also gold ones!